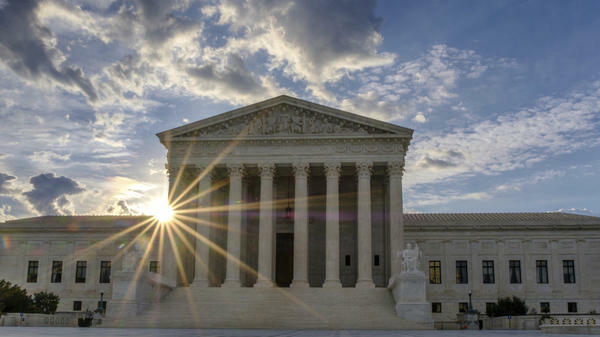 "Everything that we're doing is really pointing to the future of the Supreme Court," said the vice president of strategy at Americans for Prosperity. The U.S. Supreme Court building is shown in Washington, D.C., on June 25, 2017. A conservative group funded by billionaire brothers Charles and David Koch is turning its attention to a new front: promoting federal judges at the grass-roots level. Americans for Prosperity is willing to spend nearly $1 million to confirm judges this year. Those lifetime appointments could reshape the courts for a generation. "The fact of the matter is that so much of what affects us in our daily lives plays out in the courtroom," said Sarah Field, the group's new vice president for judicial strategy. But even more important than the money could be the firepower AFP wants to engage. The idea is to mobilize conservative activists across 36 states for key confirmation fights this year. That includes people who call their home-state senators, write letters and knock on doors. For now, ground zero is in Wisconsin, where AFP state director Eric Bott said it's a little too cold to knock on doors just yet. Bott said his network of 130,000 volunteers has rallied for Tea Party causes, supported Republican Gov. Scott Walker and fought for limits on the state's collective bargaining laws. Now, those volunteers are turning their attention to judges. "A lot of our activists are really looking for certain types of jurists," he said. "They want a judge who's going to respect the rule of law. They're looking for a judge who's going to interpret the Constitution as it was originally intended." AFP has already thrown its support behind one of President Trump's judge picks this year — Michael Brennan, a Milwaukee lawyer and ally of Gov. Walker. Wisconsin's Democratic senator, Tammy Baldwin, refused to turn in a blue slip for Brennan. The blue slip is a way for senators to signal support for a nominee. Withholding that paperwork usually means the end of a nomination, as Baldwin noted in a letter earlier this year. "President Trump's nomination of Mr. Brennan disregards the longstanding, bipartisan process in Wisconsin that has informed the selection of federal judges in my state," Baldwin said. "This is a particularly troubling step at a time when institutions and traditions of democracy seem under constant attack, and bipartisanship feels like a fading concept." But the Republican chairman of the Judiciary Committee, Sen. Charles Grassley of Iowa, broke with 100 years of tradition and held a hearing for Brennan anyway. Last month, Brennan advanced out of the committee on a party-line vote of 11 to 10. He's waiting for action by the full Senate. AFP is buying digital ads to encourage a quick vote. "This is a seat that has been vacant longer than any other seat on the federal bench and the people of Wisconsin deserve to see a judge confirmed on the 7th Circuit," said Sarah Field of AFP. Kristine Lucius of the Leadership Conference on Civil and Human Rights said that's not the full story. Lucius pointed out that the current nominee, Michael Brennan, wrote an opinion piece supporting Republican efforts to block President Obama's pick for that same job. The delay strategy worked. "And to think that that person who defended that right would now enjoy the nomination and be critical of the other senator who is exercising her own rights is the epitome of hypocrisy," she added. Lucius now fights against many of Trump's selections for the federal courts. But she said she understands why AFP is stepping up its role. "To me it's not surprising that the Koch brothers, billionaire corporate leaders, would want to invest their money in the fight to get judges to uphold their corporate rights," Lucius said. "They think this is money well spent because they are trying to tilt the bench. They are trying not to have rule of law that rules against them, but instead they want to get more people into lifetime positions that will rule in favor of corporate interests over individual interests." Judges confirmed to lifetime posts already represent one of the president's most important accomplishments. And groups on both ends of the political spectrum know that other big fights are on the way. From her headquarters in Virginia, Sarah Field of AFP says she's gearing up. "Everything that we're doing is really pointing to the future of the Supreme Court," Field said. Unlike some other conservative groups, AFP intends to make federal judges a focus of its permanent grass-roots efforts. Editor's note: Koch Industries, though not the Koch brothers' PAC, has been a sponsor of NPR.